The Joy Troopers made a 2 months backpacking trip to Greece and the Balkens sometime back. 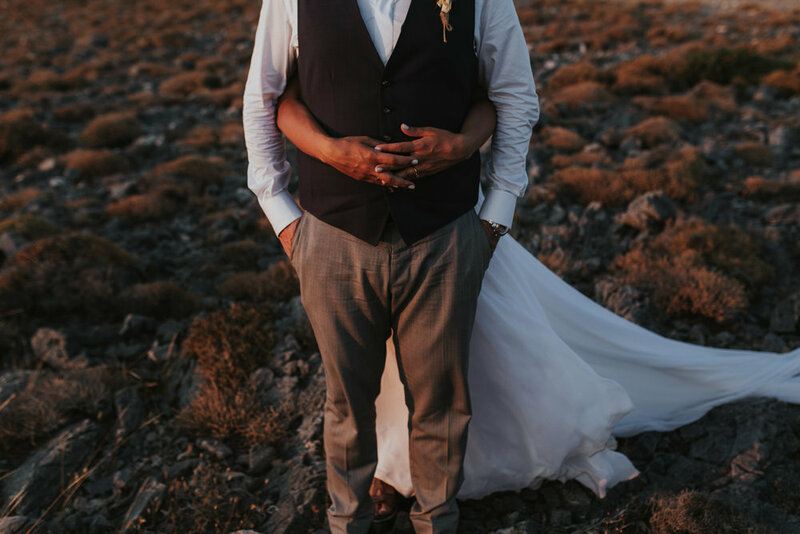 Meeting locals has always been our kind of travelling, hence we sent out numerous email requests to fellow wedding vendors in the countries we will be travelling in. I found many of them through Instagram and it's amazing how this social media tool has broaden so much of my perspectives and knowledge about Wedding design. Days Made of Love was one of the many vendors we chanced upon, and we are stoked when we received their positive reply! They were extremely helpful and warm, bringing us around on the first day we met. Having met many wedding photographers in the industry, we were extremely honoured to experience how they work during a photoshoot as they followed and guided the couple attentively, making every passionate shot count. Here's an interview we did with Fanis and Jenny, the intuitive eyes behind Days Made of Love. Enjoy! What gets you guys up in the morning? Usually our dog, pushing us and trying to get comfortable between us! :P But seriously, some days we wake up fully energised, looking forward to working on new projects and making plans ahead. Some other days we just want to snuggle up. When photographing, we always focus on the story that is unfolded in front of us, keeping our approach unconstrained. Our style; Natural, creative, storytelling. What's your favorite thing about shooting weddings? It is a mixture of elements during a wedding day that fascinates us. Starts with being able to witness the pure love between two humans, the intimate moments they share with their loved ones on that special day, the emotions, the happiness, the tears of joy. It is also the challenge to adjust in any situation, to act fast, to capture the moment. What do you guys enjoy about living and working in Thessaloniki, or Northern Greece? North Greece is beautiful, a mixture of mountainous environments, forests and coasts. We have always enjoyed to escape in these places and explore unknown paths. We live in Thessaloniki in North Greece, but we are not working here anymore, we prefer to work in the islands. Just because we have done exploring this part of Greece and we are ready to discover more areas. We are actually thinking to move souther in the next few months. Maybe in a smaller town where we can relax and enjoy our winters. Each photographer possesses their own eye for details, colour for mood and habits on their shoots. How do both of you complement each other so well? Maybe this is because we are also a couple in real life. We are partners and we have learned to operate together in harmony. Fanis, can you describe Jenny on the shoot with you? Jenny and I work together for the past three years; For the last year under the brand name Days Made Of Love. While working, Jenny is unstressed and that helps me stay calm when experiencing a difficulty. Since the first time we worked together until the present day, she has always been working hard on improving her style; I am very proud of her and the images she makes, but most of all for her personality. Fanis is the reason I started to work as a photographer. I learned everything I know about photography from him, and I followed his steps when shaping my own style. Fanis is very supportive to me. Under any circumstances, he remains always focused. What I like about him the most is this innocent happiness when he really likes something. He is always so kind, and makes our couples feel comfortable and laugh with his jokes; I admire him for being that professional. He never stops improving and he never goes to bed until he finishes a task. Favorite image you've taken lately? What gives you a mental Hi-5? Perfect lighting conditions + epic backdrops + passionate people. Like adventure-holics we are, we’d like to shoot somewhere we have never shot before. As far away as possible. Let’s start with Northern Europe. We’d also like to shoot overseas sometime, it is in our immediate plans. Best thank you that you've ever received? When the father of one of our brides left us a thank you note, highlighting the importance of having us to take their wedding photos. This was so touching. Kind acts like this one are the reason to keep going on. Best experience with a couple you met so far? This is hard to tell. We have always been gaining different experiences from our couples. We have laughed with them, be touched by their story, we have explored amazing places and met new cultures. This is an one of kind experience; This is why we love our job. We built a relationship together that goes far beyond the take the photos/deliver the photos part. The number one tip for the couples is to search for someone that fits their style. You could decide if a photographer meets your needs and your style by just dedicating some of your time to view their portfolio and chat with them. There are numerous remarkable wedding photographers out there, but not all of them make a good match with all couples. But the most important, the key to a perfect collaboration is trust. You gotta go for someone that you will trust heart and soul. Since beginning this business, we have worked with many different couples and we have learned a lot of things. What influenced us the most is the love that is radiating, when two people become one. This is so moving, and inspiring at the same time. Lastly, what are you guys looking forward to most right now? Visit www.daysmadeoflove.com for more of Fanis and Jenny's works.